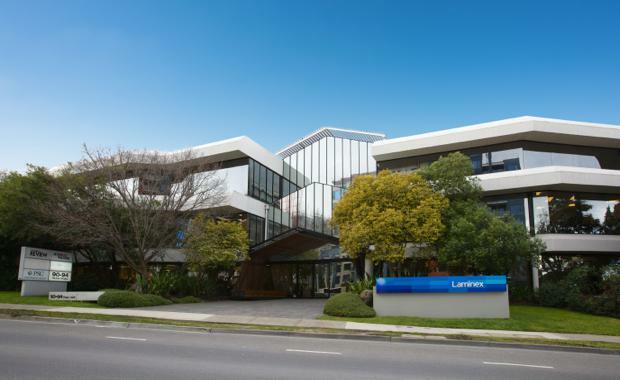 A three-level office building in Doncaster, fully leased to tenants including The Laminex Group, has changed hands for $16.1million after being offered for sale in a secure land bank opportunity with future development potential. Colliers International’s Peter Bremner and Nick Rathgeber have negotiated the sale of 90-94 Tram Road in Doncaster in an off-market expressions of interest campaign.The sale represents a passing yield of 6.87 per cent and capital value rate of $4,637/sqm. “The property was purchased by HSA Capital Pty Ltd, a local private investor and developer who has been looking for a good suburban office for a while and liked the high underlying land value on offer at this site,” Mr Bremner said. The property has been owned since 1999 by Juilliard Group, who has recently received a number of unsolicited approaches and offers from buyers. The three-level office building comprises 3,472sqm of light-filled office accommodation and 111 on-site car spaces on a 4,097sqm site. It is located close to the corner of Doncaster Road and Tram Road, opposite Westfield Doncaster Shopping Centre. The building is fully leased to four tenants including The Laminex Group, who occupy more than 70 per cent of the building and has been a tenant for over 15 years. Other tenants include Dun & Bradstreet, Professional Services Corporation and Metro Media, making the building fully leased with a varied lease expiry profile. Current net passing income is approximately $1.106 million per annum. Mr Bremner said the property represented an ideal land banking opportunity. “It has an exceptionally high underlying land value which is arguably close to the investment value of the property,” he said. “The enormous site area of 4,097sqm enables a range of alternative future development scenarios. The property is situated within the Doncaster Activity Centre Zone, in a prominent main road location with a substantial frontage of just over 70m.